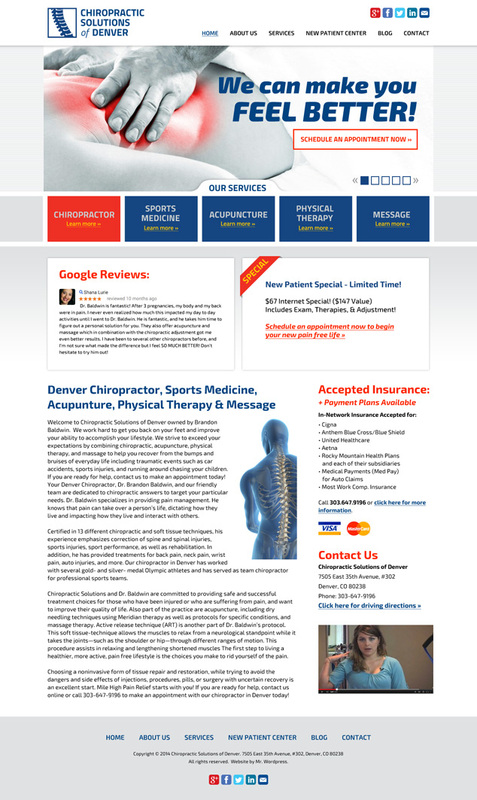 Visual Lure recently completed this new website home page design for Chiropractic Solutions of Denver, a Colorado chiropractic practice that provides sports medicine, acupuncture, physical therapy and massage services. Their current website has an extremely high bounce rate and a very low click through rate due to its generic look and lack of call-to-actions. The new design features a strong message, “We can make you FEEL BETTER!”, which is essentially what all their services are focused towards. We also decided to showcase their Google Reviews because they have over 25 all of which have 5 star ratings. A new patient special was also added to entice users to schedule an appointment online. Note: We were contracted to do the design only on this project as another company will be doing the development. The new website will be developed in WordPress by a Colorado based WordPress developer.